Hinckley, Minnesota—One of the more rewarding things I do is visit sheep graziers around the U.S. and Canada who do an outstanding job producing a quality product. I’ve been absolutely amazed at the healthy, well-grown lambs with clean backsides and loads of bloom that reach marketable weights on all-forage programs. Photo: Janet McNally. 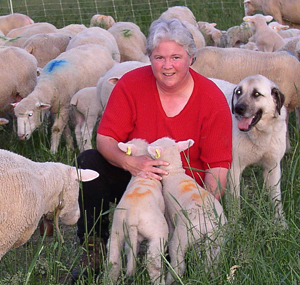 Janet McNally’s May-born lambs were raised on native pastures until weaning, then finished for six weeks on turnips. They were wormed with valbazen August 1 and September 15 for flukes. Average weight for the entire lamb crop was 82 lbs. on November 16, and another five weeks of grazing should put the average to 100 lbs. Including the dam’s feed cost, total per-lamb feed cost from birth to 100 lbs. is $18. While everyone is almost on their own in exploring what works and what does not, many of these people come to the same conclusions on some things, such as breeds that work and those that do not. Yet they may have a dozen different strategies for addressing problems such as parasites, all of which work. The bottom line is that there are a good number of producers around the country producing quality, grass-fed lambs. Evidently that message has not quite reached everyone. For instance, Dr. G.F. Kennedy, an outspoken veterinarian and sheep producer near Pipestone, Minnesota, is known nationwide as the go-to expert on sheep health. 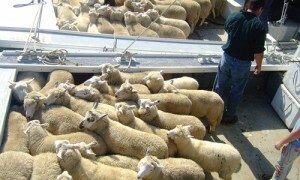 Dr. Kennedy announced in his October 2011 sheep newsletter that, “unless you are in a semi arid or dry region, lambs on grass generally don’t work. If the worms don’t get them, coccidia generally will. Our grass here in the Midwest and in the heavier rainfall areas just doesn’t work without extremely good management and I question the risk reward value. There is a basis for Dr. Kennedy’s thoughts, and it has to do with fact that the majority of U.S. sheep and beef cattle are still grazed on unmanaged pastures. I especially noted that in 10,000 miles of highway driving this past year, as it was a very rare sight to see cattle or sheep on pastures that were being managed any better than simply tossing the animals into a pasture in the spring, and then leaving them there until the snow flies in the fall. Most of those pastures appeared to have never mustered more than an inch of forage. Photo: Jeff Rogers. 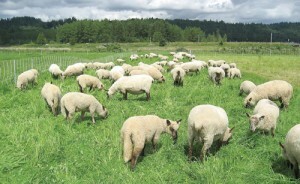 Jeff Rogers’ Clun and Clun mule lambs graze intensively managed, improved pastures in western Washington (38 inches annual precipitation). 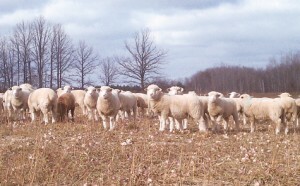 Most of these lambs will reach 130 pounds by six months of age. Jeff controls parasites by using daily moves, adequate rest until grass is reasonably safe from parasites, clipping to control quality and reduce parasites, and lower stocking density to meet organic rules, leaving behind a 4-5 inch stubble, or 1,500 lbs. dry matter/acre. This kind of “management” will indeed result in problems with parasites and coccidia in the more humid regions of the U.S. It also will result in low forage yields and reduced carrying capacity. As land is the largest of all costs in the livestock business, it behooves us to manage it so that we harvest as much product as possible. 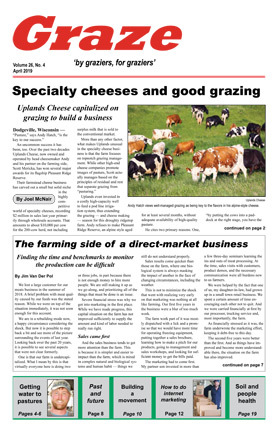 Yet pastures are often treated as if they are unresponsive to management. I also agree that the mixed prairie grasses prevalent in Minnesota can be challenging, as the plants are not very palatable. Higher rainfall rates increase the management challenge, while improved species have a way of freezing out. The area where Dr. Kennedy lives is corn and soybean country, where busy spring schedules mean that pastures are not likely to receive the attention they deserve. So it really is not so surprising that Dr. Kennedy has concluded that raising lambs on grass is not worthwhile. As a veterinarian, his focus is on treating the problems that result from poor management. It can be very frustrating dealing with sheep flocks suffering heavy parasite infections on over-used pastures. Problem is, Dr. Kennedy is not comparing apples to apples. The predominant lack of pasture management is akin to the intensive confinement producer feeding lambs a whole-corn diet without balancing the ration to prevent calculi. Or not taking care to introduce feeder lambs to grain slowly to prevent acidosis. Or not feeding ewes properly for pregnancy or lactation. Or not properly bedding or ventilating the barn, thus causing problems with coccidia, pneumonia, and baby lamb scours. Without proper management, there will be losses in a traditional, corn-based confinement operation. Pasture is no different, as low input does not mean no input. You also need to apply management if you want to prevent losses on pasture, even though the problems and the management are different. So it is rather silly to try to make a valid comparison between a well-managed, grain-fed system and an unmanaged, grass-based system. These specially selected North Country Cheviot lambs (with a smattering of Scottish Blackface) were reared on Islands off the coast of Maine, where annual rainfall is 48 inches, plus 70 inches of snow. These lambs are not managed beyond careful stocking of the islands until fall harvest. Ewes remain on the islands and are never drenched for parasites. 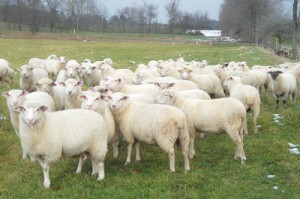 Target is 40-plus pounds carcass weight, with lambs sold into a high-end market. Scottish Blackface and North Country Cheviot rams selected for parasite resistance are important to successful grazing in this wet climate. 1. Breed choice is important. In the photos, you do not see really tall-framed sheep or breeds typically found in midwestern confinement situations. British and European continental breeds work best on midwestern and East Coast pastures, but I don’t mean the tall, Americanized versions. Successful pasture operations use breeds that are well-adapted to the forages grown in their area. Hair sheep tend to work well in warmer climates. 2. Grass must be managed for quality and parasite load. Just like ventilation and sanitation in the barn, grass needs to be managed for optimum nutrition and to keep animals from ingesting high levels of parasite larvae and coccidia. Six-week pasture rest periods can eliminate drenching by allowing peak parasite loads do die off somewhat before the sheep return. Clipping pastures between grazing events helps reduce parasite loads while keeping paddocks vegetative. Some grazing crops, such as chicory and birdsfoot trefoil, have been found to reduce parasite burdens. Rotating grazing events between sheep and cattle can also help keep vegetation at peak nutritional value while reducing sheep parasite burdens. Since parasite larvae climb up and down the grass with the dew, managed grass that is taller than the grasses found in most continuously grazed stands effectively reduces the number of larvae that sheep ingest. Fencing off access to surface water and having a clean bed to lie on each night will eliminate clinical coccidiosis. 3. Annuals are great for finishing lambs. In the northern states, the growing season is not long enough to allow lambs to reach a state of maturity where finish comes easily. Also, grasses prepare for winter by pulling sugar from leaves and stems and storing it in the root, thus reducing the palatability and energy content of fall grasses. Grazing annual crops is infinitely helpful in assuring lambs reach desired market goals, with the important bonus that tilled crops are parasite-free. 4. Producers are using new technology to manage parasites. Examples are using FAMACHA scoring of eyelid color, and culling susceptible animals. Copper wires in a bolus device have been shown to improve parasite resistance. In other parts of the world, producers are using EBVs for parasite resistance when selecting their rams. 5. Predator control is enhanced. Managed grazing usually means smaller paddock sizes, which also enhances the effectiveness of guarding animals and overall predator control. 6. More time is available to manage animals. Moving fences, clipping paddocks and monitoring parasite status takes time, but so does hauling feed and manure in a corn-based confinement operation. Because the pasture operator is not hauling feed and manure during lactation (and in some cases lambing), a lot more time is available for managing the animals. Photo: Bob Leder. Veterinarian Bob Leder grazes these Dorset/East Friesian/South African Meat Merino wether lambs in eastern Wisconsin, which averages 32 inches of annual precipitation. Lambs are drenched every three to four weeks before weaning, then moved to clean hayfields for fall grazing. Terminal sires include Shropshires and Oxford/Hampshire crosses. 7. Margins are competitive on pasture. Northern conditions dictate that pasture lambs mature earlier to achieve a marketable product. This often means selling a lighter-weight lamb (80 to 130 lbs. ), so those accustomed to corn-finished lambs often scoff that too much income is being lost. But there is more to the equation, as feed costs are much lower in a pasture-based system. So even with slower growth and lighter weights, the margins are very similar, if not better, in a pasture system — especially for those not located near a cheap source of grain or byproducts. 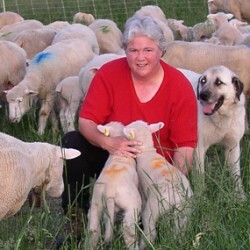 Portable electric fencing, livestock guarding dogs, and new knowledge about genetics and parasite management have greatly aided our attempts to meet the challenges of producing lamb on grass in the more humid regions of the country. Sheep require management whether they be kept in confinement, or out on pasture. Producers who have adopted new technology and applied good management practices have become successful pasture lamb producers. Do not let the naysayers stop you from capitalizing on a largely untapped resource. Janet McNally grazes sheep near Hinckley, Minnesota.